2012 has been over for more than a week now. I’m glad it is over! It as definitely the most exciting, or dramatic, year of my life and there were some incredible highs and some forgettable lows. I spent more time in the wild than ever before in my life, but I also came face to face with my own death. The year began with a long trip to Africa as a guest of a research group in the Etosha National Park. Volunteering to help the researchers with their fieldwork came with fantastic benefits that included spending lots of time with the animals of the southern African savanna. 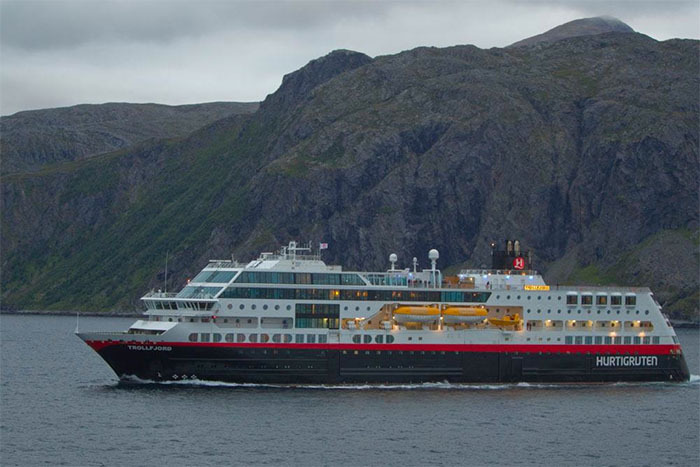 After the African field trip, we moved to Norway in May where we will be based until the end of 2013. Our time in Norway was frequently interrupted by overseas trips – two to America, once again to Africa in November and one trip to India. 2012 will remain a year of the great and the not-so-great memories. Here are the 20 photographs that defined my 2012. 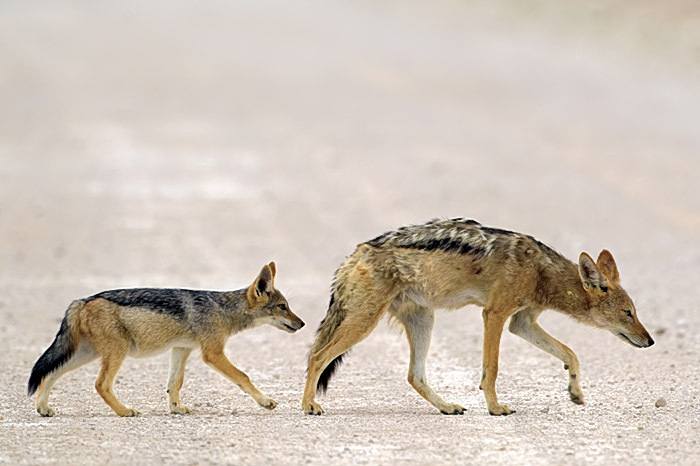 Black-backed jackal and pup. This was one of the first photographs I got in 2012. Well-fed jackal pups and their mother were on one side of the road with a male springbok on the other side. The pups, as playful as they are, decided to cross the road to harass the territorial springbok and were chased away easily. The pups went straight to their mother, with a complaint perhaps. The mother then decided lead the pups across the road, walking cautiously towards the much bigger springbok. This photograph shows the cautious walk of the mother, who knows the dangers, and a pup’s bold walk behind its ‘most-powerful-mom-in-the-world’. Pronking springboks in the Kalahari. Springboks are beautiful but their antics are among the best in the animal kingdom. The young springbok lambs seem to do most of the pronking when the weather is great (aka cool). I saw pronking for the first time in early 2012 in Etosha and was extremely impressed. However, on my last morning in the Kalahari (Kgalagadi), I had to stop my car to let a big herd cross the road. I was late and I wanted to leave the park as early as possible and was tempted to squeeze my way through the endless stream of boks coming through. After the last springbok had crossed, I fired up the car and started moving as quickly as the law would allow me to. As I adjusted my rear-view mirror, out of habit, I saw the most incredible sight I had never imagined. Nearly the entire herd, hundreds of them, were madly pronking with the rising Kalahari sun. The lambs were the most active, but the adults joined in the fun too. Oh, what fun it would be to be a bok that springs! 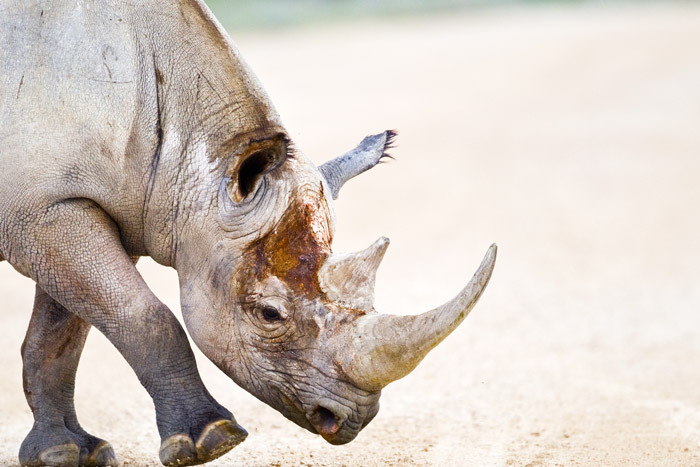 Injured black rhinoceros. The first rhinoceros I saw in 2012 was a dead black rhinoceros. It was killed in a fight with another male. I was told that the victor was badly injured and may have died or would die by those who saw a film captured by some tourists. I had passed by the scene of the fight a few times and each time I drove by I would look out in the direction where the rhino carcass was dragged out to. On this particular day, I stopped to look at a suspicious looking rock in the area and pointed my binoculars at it. It was a black rhinoceros, and it was moving in my direction! As the wind was favorable (or that’s what I thought), the rhino made quick progress of the hundreds of yards and soon stopped right in front of my car as if it was surprised by my presence. That’s when I noticed the injuries on this animal. This was the victor. He had survived! There was blood all over his head, there were large wounds on his hind legs and shoulders, but he was feeding and moving with no visible discomfort. Chital school portrait. I made a quick trip to India in February and squeezed some time to go to Bandipur where I had not gone since 2008. Four whole years away from my favorite place in India was quite difficult, but there’s a reason Bandipur is my favorite: I always see something exciting there and I always come away with amazing memories. Chital define the fauna of Bandipur as they are everywhere along the road from the park entrance to the Mudumalai border. This group of young chital fawns were under the care of an adult female (in the background) with their mothers out working (also known as finding food in the animal kingdom). 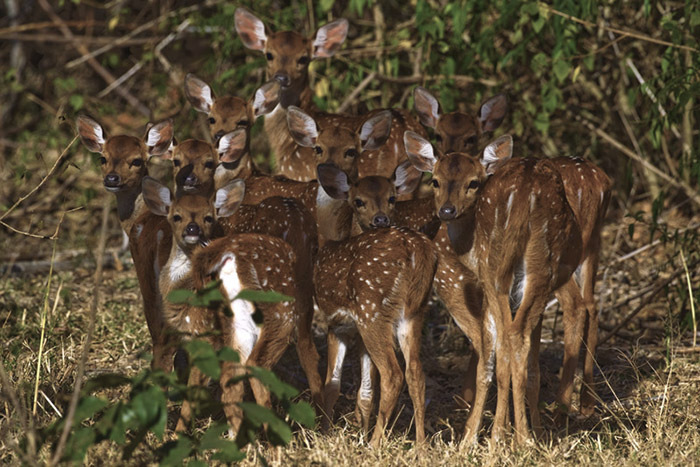 Nobody seems to stop for Chital, but seeing this group huddled together closely in the shade was just too beautiful to drive past without a photograph to show. I asked the car to be stopped and the noisy braking meant the group stood up instantly and looked in our direction allowing us just enough time for a ‘Class of 2012’ portrait! Tiger! This is Bandipur’s totem species. Everyone who goes to Bandipur wants to see one. 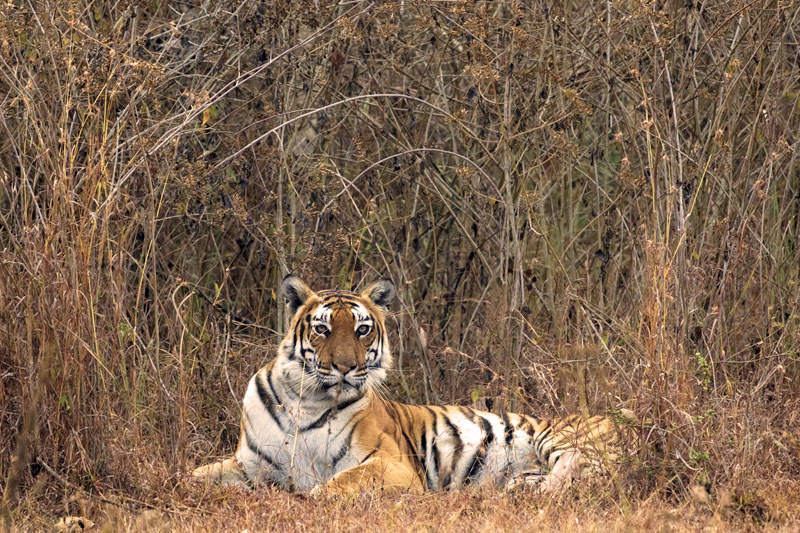 Ever since I moved away from India, I seem to have had good fortune in seeing tigers: six out of six visits to Bandipur and Kabini from 2007-2012 have resulted in tiger sightings. They are messing with my brain as if to show me what I’m missing by not living in India. Tiger sightings in south India is quite rare and even those tigers that are gracious enough to show themselves quickly disappear into the jungle. This tiger stayed with us for nearly twenty minutes before she got up, scent-marked her territory and moved into the cover of the forest. Incredible. Leopard! 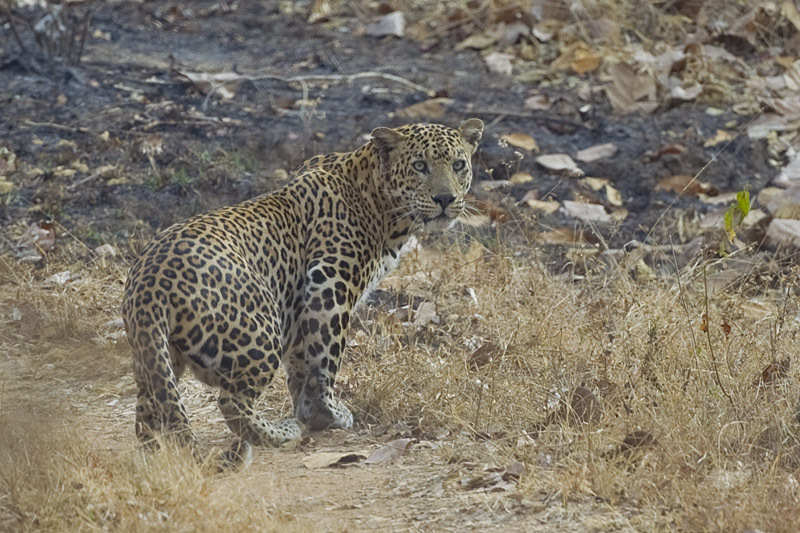 Minutes, yes minutes, after seeing the tigress we ran into this big male leopard. I saw the cat first but the driver refused to believe me. Thankfully, he stopped just to make sure and that gave the leopard the chance to cross the road. It was on the move and just took a moment to stop and look at us before doing the disappearing act that cats are so good at. Cheetah in Kruger. Days later I was in Kruger National Park in South Africa and ran into this beautiful male cheetah. 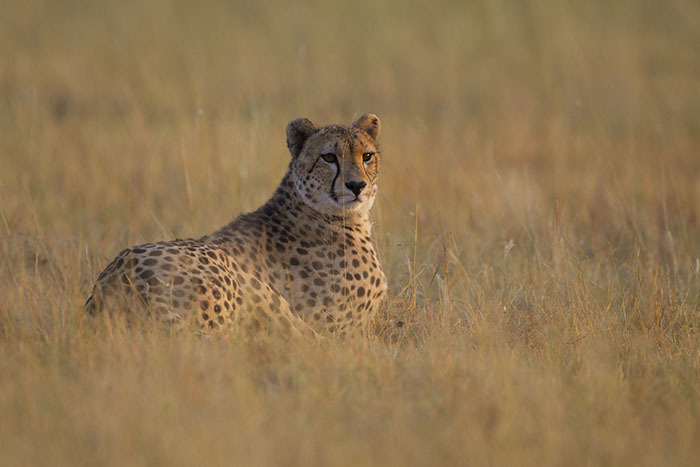 The sun had just come up and there was just me and this cheetah in the beautiful warm light of the rising sun. There was peace in our world and the cheetah stayed put. No other car, cat or ungulate came by and I was happy to spend an hour with the animal. In the end I lost the battle of patience and went away leaving the cheetah to bask in his territory. Lion in Etosha. I must have seen a hundred lions this year. Maybe more. I saw five or six prides in Kruger, maybe six or seven prides in Etosha and perhaps ten or more prides in the Kalahari. Lions have incredible calls and its a call that sends a shiver through our bodies – we are programmed to fear them. 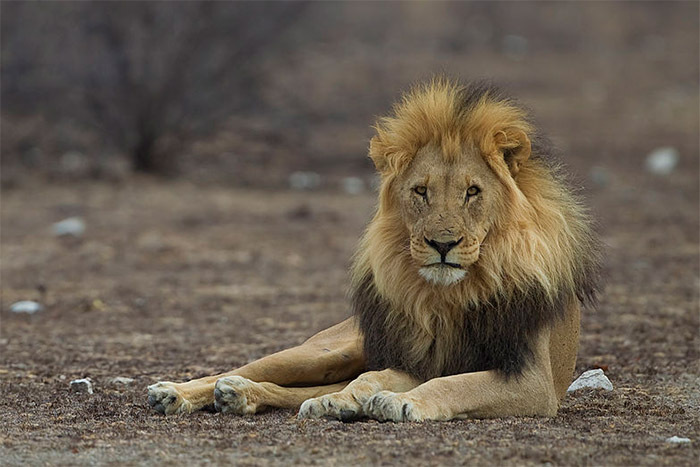 Lions that are many miles away can be heard very well, but the scariest calls are when they are close to the fence (hundreds of yards) when it feels like they are under the bed. It’s incredible. The male in this picture belonged to the biggest pride I saw in all of 2012. There were six females and at least seven cubs along with this male. The pride was right beside the road, resting after what seemed like a hugely successful night of feasting. Three hours was all I could spend with them as the sun keeps its own time and was quickly disappearing behind the mountains. Jackal in a zebra skin! 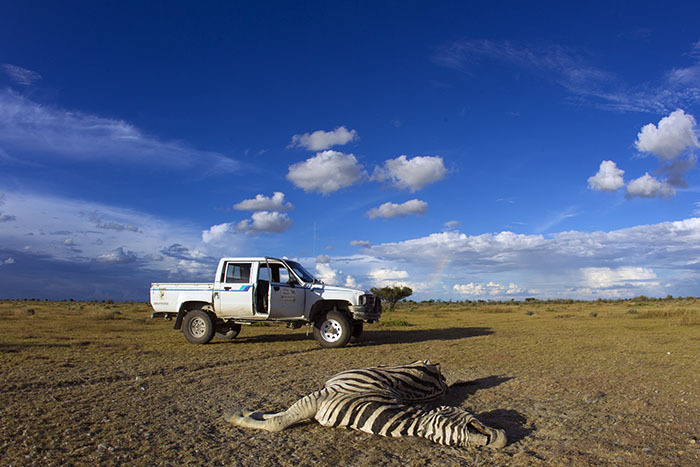 It’s apparently a common thing to see dead zebras moving in Etosha! I had never seen that phenomenon before until I approached this zebra carcass for sampling. The vultures were all around but not on the carcass as this jackal was feeding on it. While I pulled out the gloves, the swabs and filled out the report I saw the most crazy thing. The jackal went into the empty zebra belly and started feeding from the inside – with the dead zebra wildly moving about. That’s when I pulled out my camera and had just enough time to photograph the jackal coming out of the carcass. I love the look the (anthropomorphic) embarrassed look on the jackal and the disgusting look that the vulture is giving to the jackal. Sampling Carcasses. Part of my volunteering time included finding dead animals and taking samples for a disease study. In the Okaukuejo zone of Etosha, during or just after the rainy season, disease seems to kill more zebras (and springbok) than predators. Predators can also be opportunistic and will take over a carcass if they can find one. To take samples, a person has to get out of the car and walk to the carcass and then crouch to sample. It’s a vulnerable position if an aggressive predator is around. The protocol is to look around carefully and only step out of the car if there’s no predator (primarily lions) around. 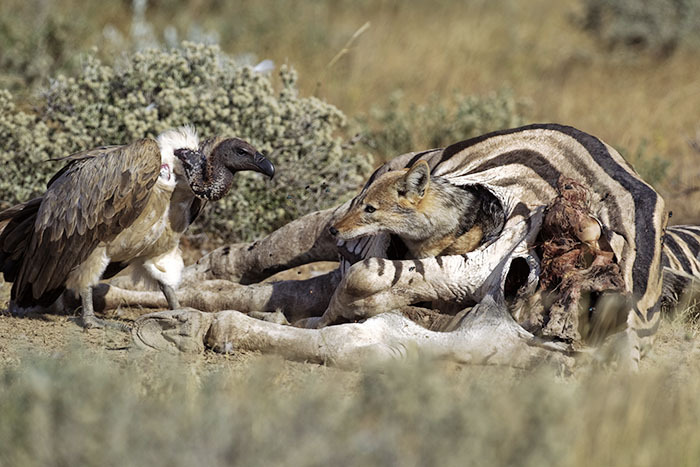 Vultures and jackals move away from the carcass but hang around the vicinity and come right back once a researcher’s job is done. The Etosha Pan. Empty places are strange. They are both beautiful and scary. 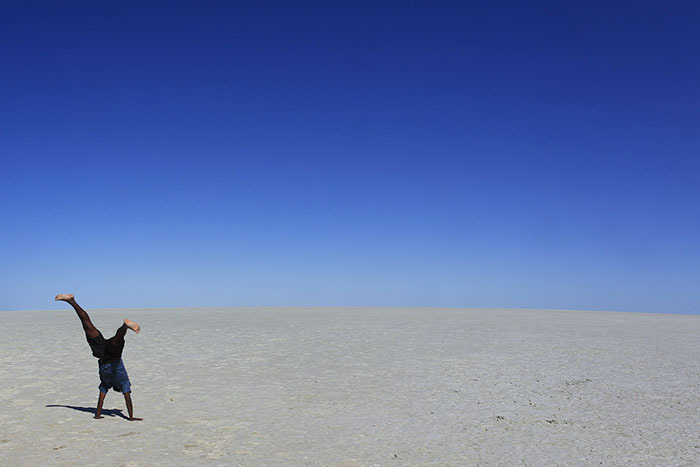 The Etosha pan seems to stretch on forever. The soft surface invites us to be children again. It was a cool day in the park and we had just seen an African wild cat, a pride of playful lions and a honey badger. It was time to celebrate the joy of seeing beautiful animals and I couldn’t help myself from somersaulting on the soft surface of the pan. Rhino capture and relocation. I was fortunate to be a guest observer of Namibia’s elite rhino management team on one of their relocation missions. 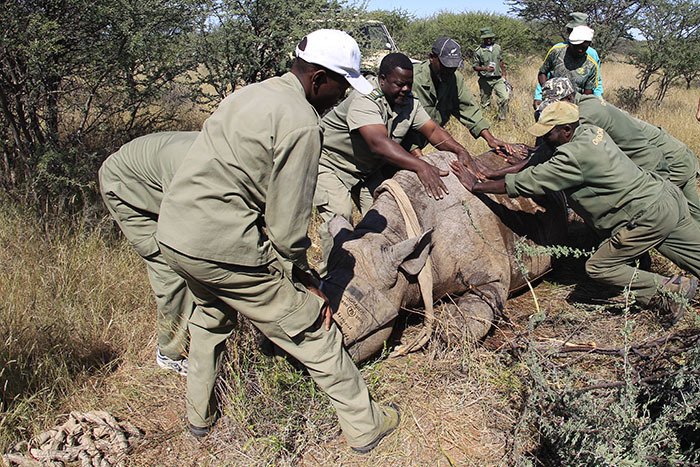 Wildlife is well managed in Namibia and I could see how dedicated the staff were in the handling of a wild rhinoceros that had to be relocated. The helicopter with the vet found and darted this rhino from the air. However, the rhino went down on its side — which is both dangerous for the animal’s life as well as difficult to work with. In this photograph, the team trying to push over a fully-grown adult rhinoceros from its side to an upright position. It’s the dedicated work of people like this that gives hope to these rare and very endangered animals. 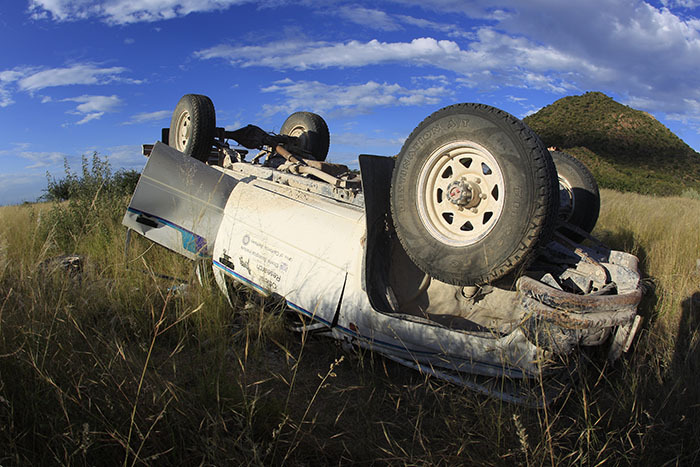 When I saw death coming… Two researchers and I were on a gravel road, as most roads in Namibia are, on our way back to the Etosha park. The two researchers were in the front seat of the double-cab truck with me in the back seat, which had no seat belt. Suddenly, the car was out of control and wildly swerving at nearly 100 km/h (~60 mph). The car was going to going straight to the ditch by the side of the road. As it went off-road, I held on to the seat and went to a sideways brace position (somewhat like what they advice us in preflight safety videos). The car flipped and I kept my eyes open. In my mind I wanted to see how the end came, if it did. Then came the roll and the car went quite some distance over on its roof and stopped. There was no sound. A baboon called out from the distance. The rear window was broken and I crawled out of there. I called out the researchers and heard back both their voices but I couldn’t see them as the front cab was crushed so badly that the roof was at the same level as the window. I broke open the rear door and managed to help both the researchers out. There were cuts and bruises, but no broken bones or worse. To this day, we don’t know how we escaped virtually unhurt from a crash that completely destroyed the vehicle. Norway. 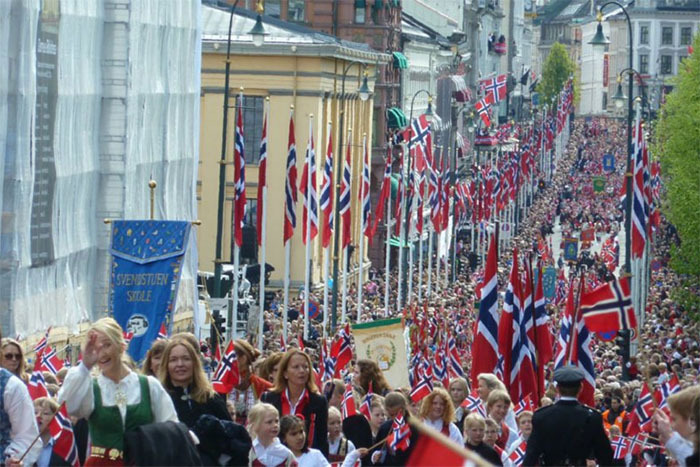 We moved to Norway just in time to see their national day celebrations. The national day parade revolves around schools and nearly every school in the area walks along the main road leading up to the palace where they are greeted by the Norwegian royal family. Most adults are dressed up in Norwegian national dresses. Å i Lofoten. 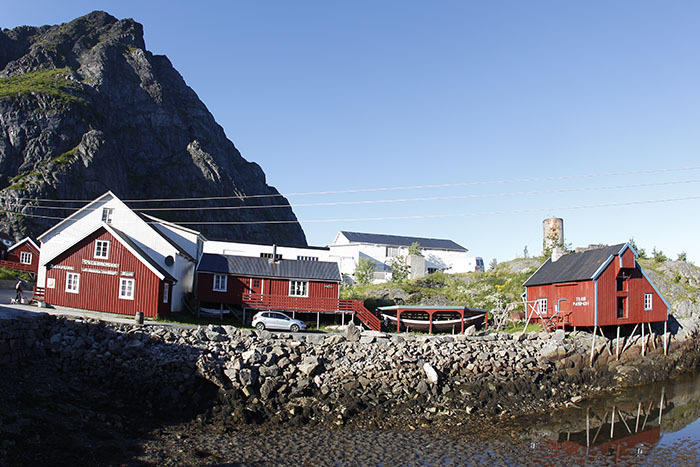 This is the infamous building in the village of Å that first produced cod-liver oil for human consumption. Or at least that’s what our local contact told us. I never thought much of cod liver oil as a child but now that I’m living in a Norwegian winter, I realize how important cod liver oil (as a source of vitamin D) is when there’s no sun or sunlight. Searching for sharks. 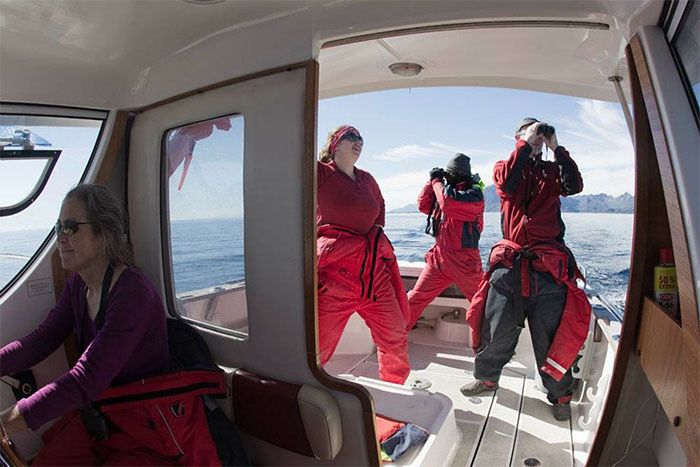 We went on a mini-expedition to look for basking sharks off the Lofoten islands north of the Arctic circle. Looking for fins to surface can be tiring but you often see a lot of beautiful things. We saw several whales, orcas and some very interesting sea birds. Ranching in Wyoming. Sitting all day in front a computer can be called work in the current age. However, working all day with animals on a ranch makes you feel like you’ve earned your dinner. 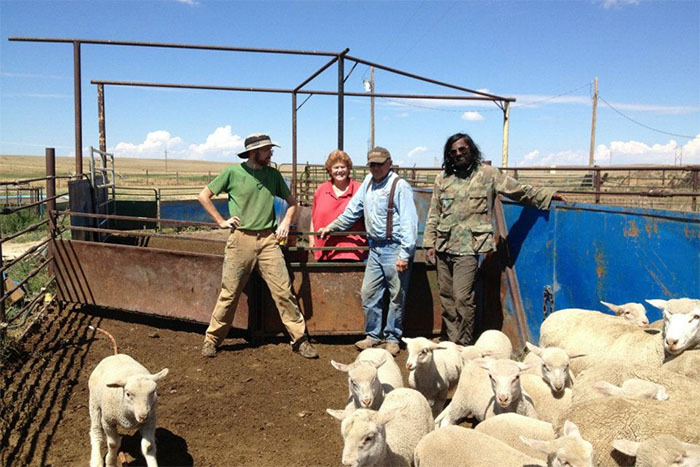 Among the various kinds of volunteering I did in 2012, helping out on a ranch was the toughest. While I loved the hardworking job, I’m not so sure the animals (sheep in this case) shared my opinion. 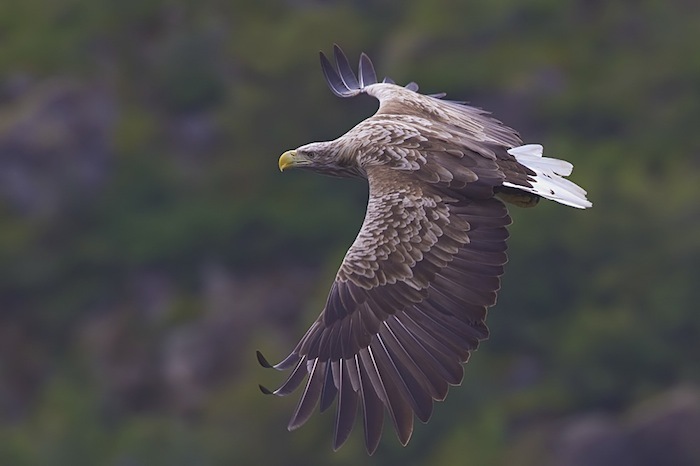 White-tailed Eagle. White-tailed eagles are rare. They have a wide distribution but are rarely seen except for in the Lofoten area where they are common. Seeing this giant eagle was definitely the high point of traveling along the coast of Norway. Hampi. 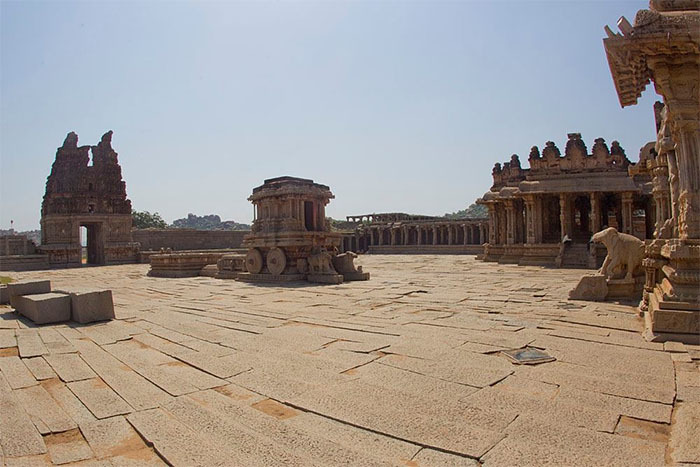 The ruins of the sixteenth century Vijayanagar empire are near a small village called Hampi in central Karnataka. I had seen the place once as a child. However, only in 2012 could I really appreciate the splendor of the place. I can only imagine how beautiful the place would have been with its sandalwood palaces and a bustling city before it was destroyed and burned by invading forces from the north.